Finding a good Product Management Definition can be a difficult thing. This is because Product Management is often defined very differently in each organization. However, companies like 280 Group and industry organizations like AIPMM have worked to create a common Product Management definition that applies to virtually all industries and types of companies. We define Product Management as the role and function within an organization that is responsible for a product’s overall success. This means that Product Managers work with all of the corresponding groups inside and outside of the company and then build and execute a plan to make sure the product best meets it’s financial and strategic goals. Product Managers work with customers and become experts in the market, technology and competition so that they can define a strategy and vision for a product and then work with engineering to ensure it is delivered. They also work with operations, executives, sales, support and other groups to make sure all aspects of the product (often referred to as the Whole Product) are aligned to succeed. Managing the Whole Product includes the product features, warranty, support, channel sales strategy, etc. 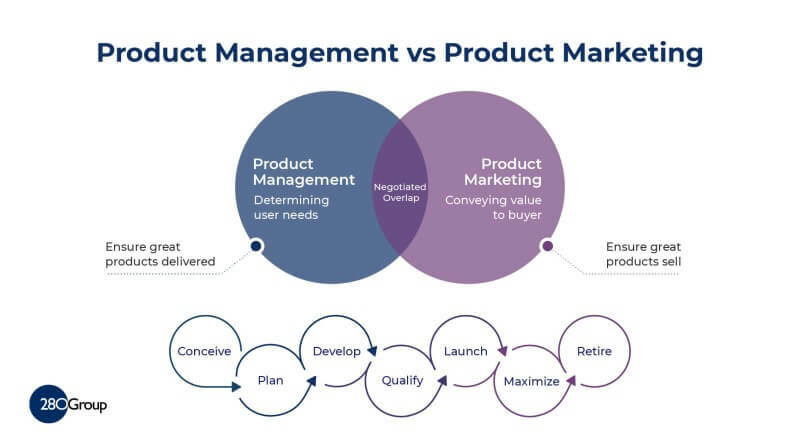 One other way to think about the definition of Product Management is to relate it to what Product Managers do versus what Product Marketers do. Product Managers make sure that a great product is built that meets customer and market needs. Product Marketers then make sure that the product is marketed effectively so that it sells well and meets its revenue and profitability goals. Another Product Management definition comes from Wikipedia. This definition is not as precise, but it gets the general idea across. To highlight again the differences regarding the definitions that are used, here is another example from Business Dictionary. This definition even states that Product Managers manage the sale of the product and support thereafter (rarely true). Product Managers do need to make sure the sales and support people are prepared, but they don’t have them reporting to them. If you would like to learn more about Product Management definitions and the roles, skills and documents related to being a Product Manager, read our full What is Product Management guide. Want to learn more about Product Management?